DR LINDA Pfeiffer is very excited for a number of reasons. 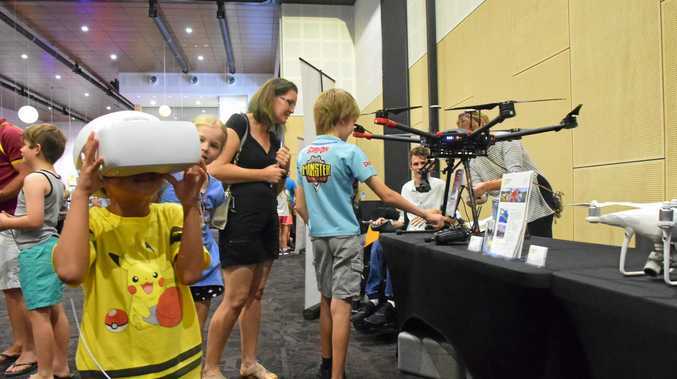 Firstly at seeing the number of enthusiastic children gathering around the numerous displays at the first Glad-STEM Expo held in Gladstone at the Gladstone Entertainment and Convention Centre on Saturday. "They love it, science isn't another boring subject for them, it's part of their everyday lives," she said. She was also delighted by the number of girls in attendance. "If you look at the mix here today, science, maths, engineering and technology are no longer male dominated fields," Dr Pfeiffer said. Finally she was proud to announce that funding from Australia Pacific LNG meant work would start this year building a STEM Hub at CQUniversity. "The STEM specific rooms will be used to train and inspire school teachers, students and our community, it's very exciting," she said. "When teachers are passionate about teaching STEM subjects they find ways to bring the subjects to life for their students." The first Glad-STEM expo was a partnership between CQUniversity, industries and Gladstone Regional Council. Students and teachers from Yarwun, Boyne Island, Clinton, Central and Chanel College were also in attendance with their inventions, innovations and displays. Teacher, Caroline Padgham and students Lachlan and Kaden from Yarwun Primary School were delighting visitors with their robotic vehicles. Glad-STEM Expo: The robots delighted visitors to the Glad-STEM Expo - young and old alike. Lachlan's was a pizza delivery vehicle, while Kaden had constructed a mobile educational vehicle which once the correct answer to a question had been entered into it. "They came up with the idea themselves and built the robots, they've done very well," Caroline said. Ruben Meerman, aka: The Surfing Scientist, was also thrilling crowds with his laser light show and dry ice displays and the team from Orica were also a hit with their small volcano. "The Glad-STEM expo is all about building confidence and enthusiasm for science and helping make the connection between what we learn in the classroom and real life applications," Dr Pfeiffer said.